When we first arrived in Australia as small children, we encountered some weird and wonderful sweets... for example, fairy bread (white bread slathered in butter and topped with colourful sprinkles), lamingtons a delicate sponge cake, coated in dark chocolate and rolled in desiccated coconut), and of course the almighty tim tam, which really needs no description! Rocky road was among these discoveries. 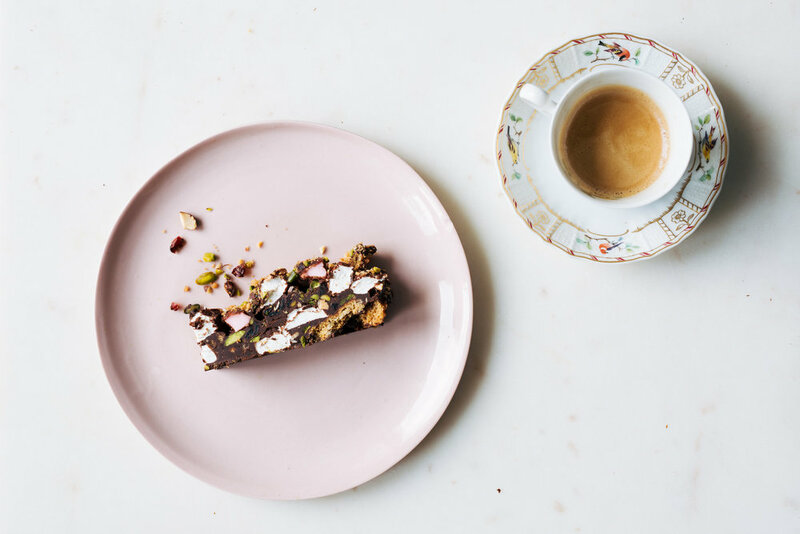 According to wikipedia the earliest documented mention of rocky road was in 1853 in Australia, where it was allegedly created as a way to sell sweets and chocolate that had spoilt on it's long way over from Europe. Once in Australia it was mixed with local dried fruit and cheap chocolate to disguise it's flavour. So cheeky! So Aussie! We love it! This also explains the name. Of course, we've added our middle eastern/ Persian twist, and the results were truly spectacular (if we may say so ourselves)... but you could experiment with loads of different flavour combinations! Enjoy! 1. Line a 20 cm x 20 cm baking tray with cling film. 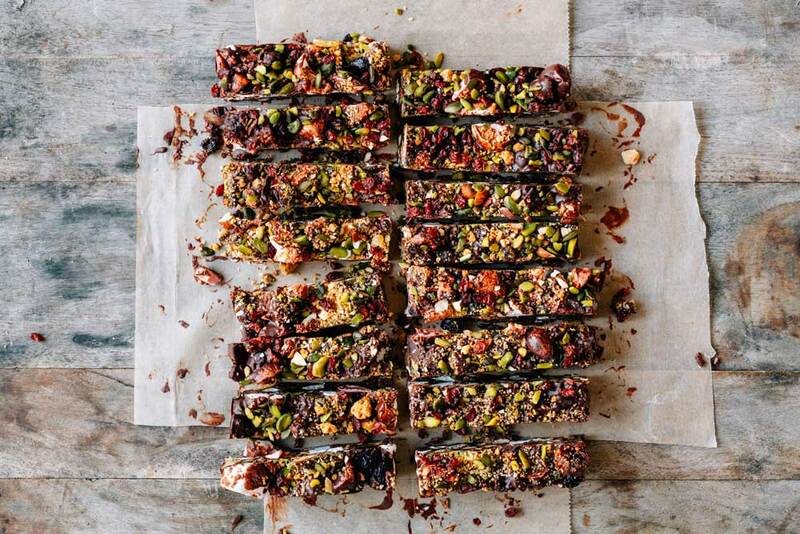 Put the marshmallows and biscuits in a large bowl, add the majority of the almonds, pistachios, sour cherries and barberries - reserving some of the dried fruits and nuts for the topping. 2. Gently melt the butter with the golden (or maple) syrup in a saucepan. Add the chopped chocolate to a heatproof bowl then pour the melted butter and syrup mix over and leave to sit for a couple of minutes without stirring. 3. Stir with a wooden spoon until the chocolate is smooth and glossy. Pour the mixture over the biscuits and marshmallows. Stir again to evenly coat all the pieces then distribute into your prepared tin in a single layer. Sprinkle your reserved dried fruit and nuts over the mix and lightly press down to make sure it is firmly embedded into the chocolate. 4. Leave to set in the fridge for at least 2-3 hours, then remove from the tin, chop into bars or squares and enjoy! Will stay good refrigerated for up to a week!